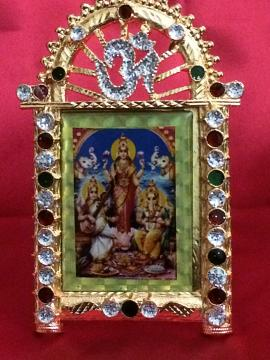 Gold finish cast metal photo frame of Ganesha, Lakshmi & Saraswati. The frame also has stone studded crafting of OM symbol at the top. The entire frame is decorated with clear and colored stones. This picture though small, is like a mandir in itself. Use it for worshiping, decorating your mandir, religious gift or office / home decor. Buy Gold Stone Work Photo Frame of Ganesh, Lakshmi & Saraswati, sold & shipped by Yaadein where you can shop online for Pooja Samagri, Hindu Statues, Puja Items, Religious Gifts & Home Decor. This Ganesh Lakshmi Photo collection has been tagged as Religious Gift, Diwali Festival Pooja, Ganpati Laxmi, Spirituality, Hindu Religion, Traditional Gift, Hindu God Statue.